iMovR’s most advanced treadmill desk workstation arrived in our labs, and we have to say it meets our expectations—which were extraordinarily high. Built on the reputed ThermoTread GT under desk treadmill, this new integrated treadmill desk from iMovR will keep you walking longer and more comfortably at work than ever before. Why’s that? The Lander Desk is more stable at taller heights than any desk we’ve tested. Free shipping in the continental United States. Additional charges for AK, HI, Canada. DHL available for international. 16 desktop colors in 3D laminate, including solids, wood grains, nebulae and carbon fiber. We haven’t seen a better desk for using with a treadmill than the Lander Desk. Its impressive stability at taller heights is enough to keep a 6’ 4” user typing comfortably with minimal work surface shaking. Its height controller is intuitive to adjust and includes a built-in health coach for developing your new walking routine. 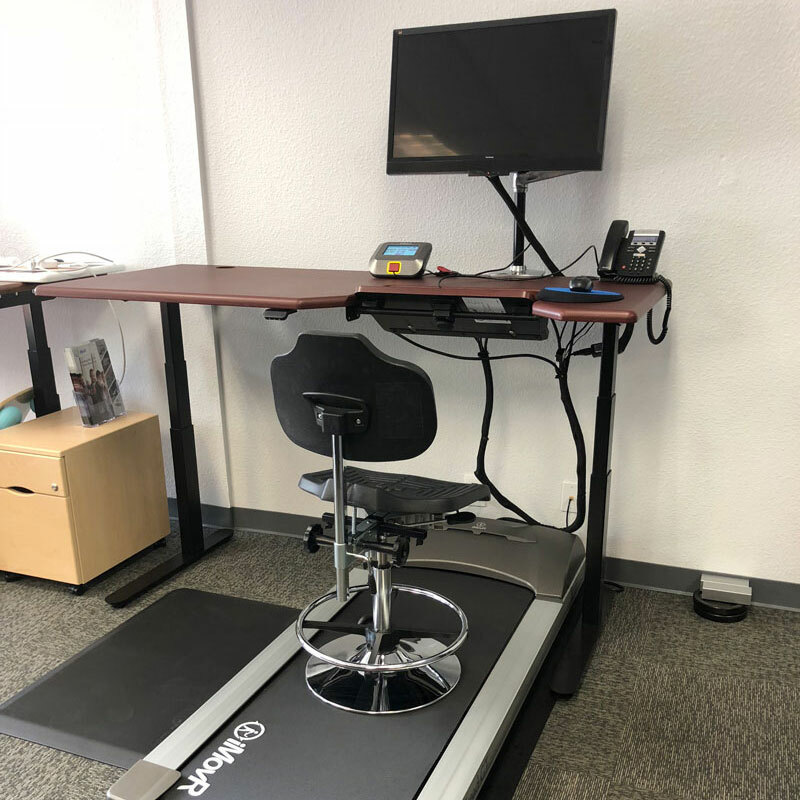 Add in an under desk treadmill like the established ThermoTread GT, and we’re looking at one of the most advanced machines designed for walking and working in the market. Most of you know our relationship with iMovR. We began WorkWhileWalking as a reviews site, investigating treadmill desk components and evaluating them from various manufacturers. Back in those days, you couldn’t even buy a full treadmill desk from one seller. You had to piece together the parts—treadmill from one manufacturer, monitors arms from another, standing desk from yet another. We’d done all the research, so we could guide people in the right direction. WorkWhileWalking.com was the place you could go to find everything you needed to build your own treadmill desk. Since those days, much has changed. We’ve grown to the point where our parent organization spun off a new company, iMovR, that sells full treadmill desks and ergonomic products. In fact, we lent them our product expertise when they were creating the ThermoTread GT, which we’re proud to say is the first treadmill truly built for an office environment. 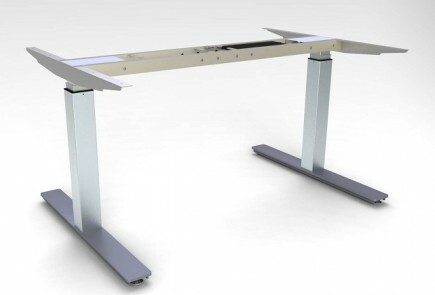 For the last several years iMovR has been building standing desks to accompany their ThermoTread GT, and we’ve continued reviewing their products and others in the market. We’ve espoused all the benefits of the ThermoTread GT before, and we’ll give the spark notes version at the end of this review too. They apply to the Lander Treadmill Desk just as they apply to iMovR’s Energize Treadmill Desk, for instance, since both employ the ThermoTread GT. All to say, we knew (partly) what we were getting into before we started to write this review about the Lander Treadmill Desk. The only question in our minds was how well the ThermoTread GT would pair with iMovR’s new Lander Desk. To answer that question, we had to try it out ourselves. When our Lander Treadmill Desk shipped, it arrived on a pallet in three boxes. After discarding the pallet and the boxes (since we didn’t pay extra for delivery upgrades), the Lander was a breeze to set up. The desk itself came in two boxes, one contained the tabletop and part of the frame, and the other had the desk feet and legs. The only thing we had to do was attach the legs to the frame. It took two people to lift the desk and flip it over, but we didn’t have to drill 30 holes into the tabletop or dig around the toolset for the right-sized allen key. The whole desk assembly process took less than 10 minutes. As for the ThermoTread GT, it didn’t require any assembly beyond taking the treadmill out of the box and plugging it in. We always test our standing desks and treadmill desks with monitor arms for proper ergonomic viewing angles, so we stacked on one we had lying around, and started our trial of the integrated Lander Treadmill Desk. 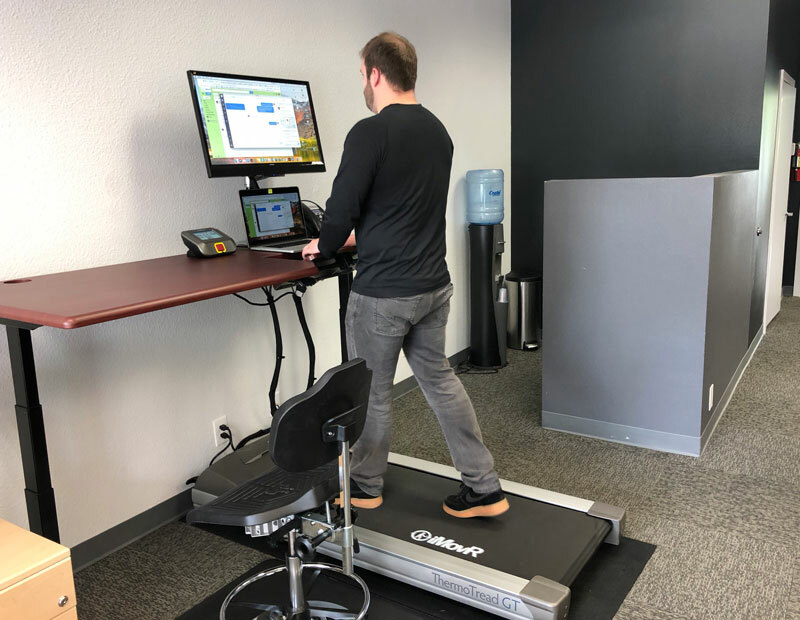 One thing you’ll note from the picture below: we tested the version of the Lander Treadmill Desk that has the SteadyType® keyboard tray built-in. iMovR has been producing this super-ergonomic keyboard tray for its standing desks for years now, and whenever we test one of their treadmill desks, we choose a SteadyType model because the user experience while typing is so much superior. The comfort-level of the SteadyType keyboard tray was the first thing we noticed using the Lander Treadmill Desk. As content writers ourselves, typing is something we do all day. You might not expect it, but walking and typing puts more strain on your wrists than sitting and typing or even standing and typing. As we’ve experienced in the past, you tend to brace yourself on the edge of your desk with your wrists while you walk. It’s called anchor stress, and it’s pretty much unavoidable. However, by tilting the keyboard tray at a declined angle and typing, you reduce this anchor stress dramatically. Instead of your wrists bending at an unnatural angle to brace your weight while walking, they’re allowed to rest naturally (at a more neutral ergonomic angle), which allows the blood to flow freely through your hands and avoids putting strain on your tendons and ligaments. We know we can walk and type for hours without our wrists or hands becoming fatigued because of this special keyboard tray. Some of our team even prefers walking and writing because the light exercise gets their bodies a state of what Dr. James Levine of the Mayo Clinic calls “non-exercise activity thermogenesis” or “NEAT” for short. Not quite full exercise, or to the point of sweating, this NEAT brings about an endorphin rush that is believed to heighten mental acuity and awareness. A couple members of our team say their most productive time at work comes while walking on the treadmill. After all, it’s said the great Aristotle delivered his lectures while walking. And many of us speak of going for a walk to ‘clear our minds’. Basically, we highly recommend opting for the enhanced version of the Lander Treadmill Desk with the SteadyType keyboard tray, especially if you plan to do a decent amount of typing while walking. 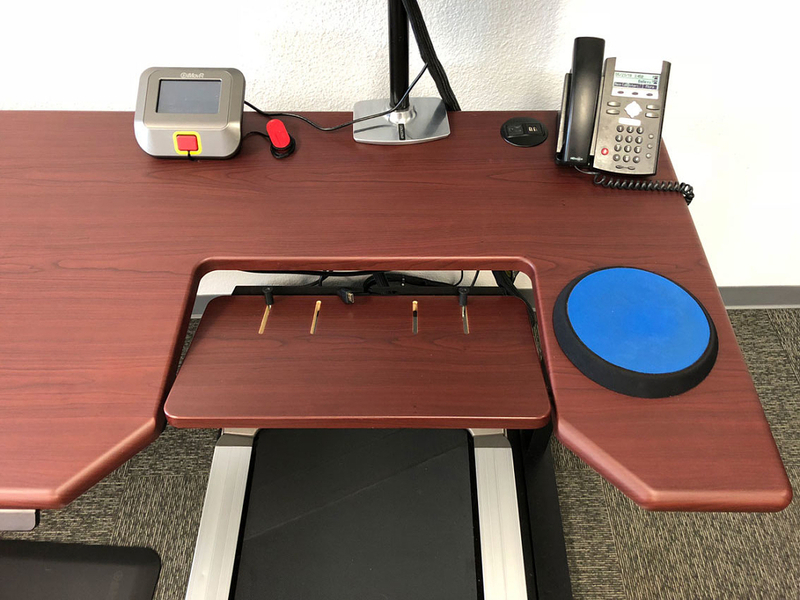 One of the stand-out features of the Lander Treadmill Desk compared to others we’ve tested is the superb stability level at its upper heights. When we’re testing treadmill desks, we pay extra close attention to how wobbly a desk is when it’s raised up to the top of its height range. Why’s that? When you are standing on a treadmill, you’re a good six inches taller than you would be otherwise. That means the desk must raise an extra six inches as well, and if it’s not stable in those regions, you’ll be dealing with a shaky work surface. A member of our team is 6’ 4” and found the Lander Treadmill Desk to be the most sturdy experience walking and typing he’s ever had. The Lander’s height range measures in at 20.5” for the lowest height and 50.5” for the highest, with the option of adding in 6” height extenders for the very tallest users. Note our 6’ 4” user was able to use the Lander Treadmill Desk comfortably without the height extenders. He did take advantage of the adjustability of the SteadyType keyboard tray though; by lowering the tray down a notch, he created more room for his arms to type. When you’re shopping around for a standing desk to accompany an office treadmill, stability is perhaps the most essential feature to evaluate. If you’re curious about all the factors that go into making a standing desk stable, you can read our in-depth article “Why Some Standing Desks Shake More Than Others”. One of the key selling features of the Lander Desk is the LCD controller and its associated smartphone app. At our workstation, we set up all four height settings using the smartphone app. There’s a button on the controller you press to enable Bluetooth connection, and the rest of the setup you do through the app on your phone. We set up four heights: one for sitting, one for standing, one for sitting on our treadmill, and one for walking. We happened to have a stool handy that rests on top of the treadmill so we used that for when we wanted a quick break from walking. If you’re looking for a standing desk to go with a treadmill, in most cases you’ll want a controller that has at least four height favorites. With the Lander, all you have to do is tap the controller twice in the direction you want to move, and your desk will automatically adjust the nearest height favorite. This makes switching positions from sitting, standing, and walking super easy. Of course switching positions is something we try to do often. As the age adage at WorkWhileWalking goes, “Your Next Position is Your Best Position”. Note: The Lander won’t come straight out of the box lifting up and down with two taps of your controller. You’ll have to go into your app’s settings tab and select ‘automatic drive’ and sign a brief agreement form. This is a legal precaution to comply with UL standards in the United States. The controller and app have another feature we found moderately helpful—the built-in health coach for giving you ‘standing reminders’, as the desk manual says. We used these reminders when we were sitting at our treadmill desk, either on top of the stool on top of the treadmill, or on the stool off to the side. You could always just use a timer on your phone for reminders to stand or start walking, but the cool thing about the controller is that it will actually light up orange when your reminder is going off, whereas previously during the interval it would pulsate green. From a health standpoint, the key thing is just to do whatever it takes to switch positions during the day. We see the the color-changing controller as a flashy feature with little additional value, but it’s definitely cool to have, and could be useful if you use it regularly. You’ll see in our photos that the Lander’s controller is on the left side of our SteadyType keyboard tray. The advantage of this positioning is that you can adjust your desk height when you’re on your treadmill or when you’re sitting next to your treadmill on the other side of your desk. It’s always within arm’s reach. However, there is one slight downside to this positioning we experienced. When you’re reaching over your desk to access the rest of the surface area, it’s easy to accidentally bump the controller, causing it to tilt and bring the desk down a smidge. Not the end of the world, and something you can certainly work around—but do be aware you can switch the controller to either side of the desk if you wish. There are pre-drilled holes underneath the tabletop on either end for attaching your controller. We could go into the quality of the Lander’s tabletop, which features 3D-lamination instead of the standard high pressure laminate you’ll see on most competitor standing desks, such as the UpLift. But we’ve rehearsed these details many times before with iMovR’s standing desks, and there’s no need to repeat. If you’re curious, you can hear iMovR bragging about it on their 3D Lamination page. Suffice to say the desk has the look of real hardwood, but with the benefits of an anti-microbial, easy-to-clean surface. The edges don’t curl or warp over time either. Evaluating the Lander Desk as a treadmill desk, the biggest takeaway is its stable work surface at the top height ranges. Don’t be tricked by the Lander’s slender legs—like we said, this desk is sturdier than any we’ve tested, even at the height for a 6’ 4” user. 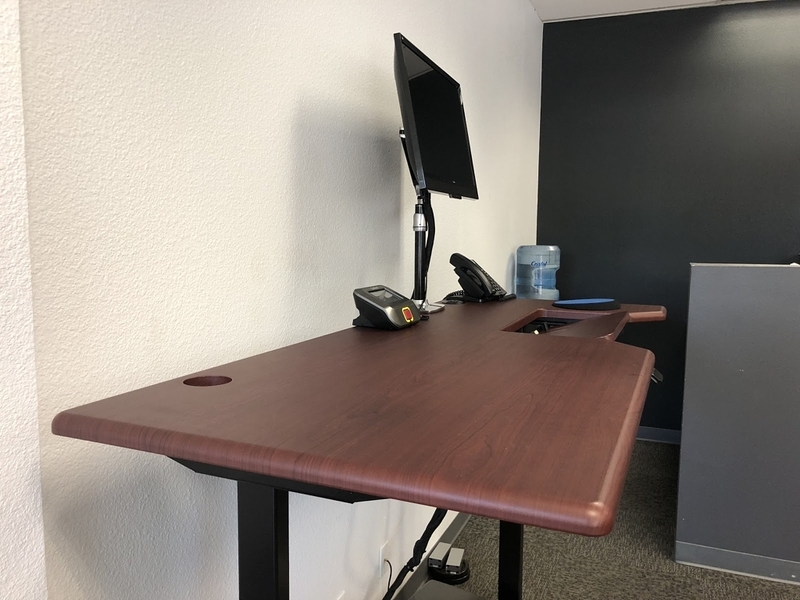 It has the American-made quality feel that it boasts, an extremely intuitive height controller, sleek 3D-laminated tabletops, easy assembly, and all the host of benefits we mention in our individual desk review, including quiet motors. We’re not surprised it generally converts into an excellent treadmill desk. That brings us to the ThermoTread GT, the office treadmill that resides underneath the Lander Desk. We mentioned it above, but the ThermoTread GT was the first treadmill really built for an office environment. Competitor units, like the ones from Lifespan, still bear the design marks of gym equipment that was designed for running and not extended walking. The ThermoTead GT’s motors come in at 42 dB, the quietest of any treadmilled marketed for the office that we’ve tested, and it’s built to withstand the weight of sustained walking. The ThermoTread’s speed maxes out at 2.5 mph, which is plenty fast for 95% of office workers. Most will find that going any faster makes it difficult for them to concentrate and work at the same time. We’ve seen someone (on our team) use weights to prop the treadmill up at an incline, a while we may not fully condone this method, it’s an interesting alternative if you need that extra level of difficulty to get your body into NEAT activity. The GT has its own controller with a display that tracks your stats like speed, distance, and time, which can come in handy if you want to see just how many calories you’ve burned, or how long you’ve been walking before you need to take a break. We’re looking at the best walking desk workstation (standing desk + office treadmill) in the market today. We’ve tested Lifespan treadmills in the past, and while less expensive, they are noisier than the GT—the most irritating part is that the fan won’t stop blowing for 20 minutes after you stop the motors. But there’s no doubt you’re paying a premium price for something like the Lander Treadmill Desk. It comes down to your budget and how much use you want to get out of your unit. While the Lander Treadmill Desk w/ SteadyType starts at nearly $3,000, it’s the kind of product you can count on to perform for years into the future, and its generous warranty backs that up. A treadmill desk is all about staying healthy at work, quitting the sedentary lifestyle, and interjecting a little more movement into your daily routine. With countless studies now pointing to the detrimental health effects of sitting (including this one about decreased brain performance), it’s even more important workers everywhere take up the crusade for adopting treadmill desks. For beginners and experienced treadmill deskers alike, the Lander Treadmill Desk is a solid choice.